A crowd of concerned onlookers watched from an overpass as firefighters worked to rescue a motorist trapped in his vehicle crushed by an overturned semi. From the sight of the wreckage, most people could only assume the victim would not survive. The accident occurred Monday afternoon in Warren, MI on the northbound Mound Road ramp to westbound I-696 under the 11 Mile Rd. overpass. Gary Sanders, 55, was driving his Chevy Impala when a passing semi truck tipped over and crushed his vehicle, leaving no time for him to escape. People who witnessed the crash immediately began flooding 911 operators with urgent calls. When police arrived at the scene they surmised that the semi’s load of metal parts had not been properly secured in the trailer and had shifted, causing the semi to tip over. 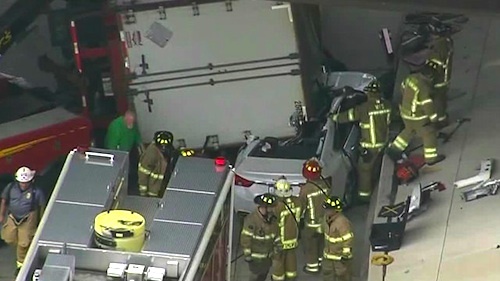 “The load apparently shifted forward, causing the center of gravity to move and cause the truck to roll on its side,” said Warren Deputy Police Commissioner Matt Nichols. Firefighters were next to arrive on the scene and immediately went to work. Raising the semi off the car slightly and using the Jaws of Life, they spent over an hour attempting the difficult job of extracting Sanders from the crushed wreckage. Meanwhile, the crowd of onlookers continued gathering on the overpass, hoping for a miracle to happen down below. “If the guy is living and they save his life it's a total miracle," said onlooker, Ed Chinoski. Then it happened. The firefighters finally pulled Sanders from the vehicle and placed him on a gurney. Sanders raised his fist to the crowd to show he was indeed alive and everyone erupted in applause and cheers. Police say the firefighters training definitely paid off and it was also Sanders’ quick thinking that saved his own life. “As it hit his car it didn’t crush it completely like a pancake immediately. His steering wheel was unresponsive, obviously — he couldn’t hit his brakes or steer out of it,” Nichols explains. “Once he lost all control he saw his car crumpling from the top, so he actually crawled under the steering wheel. You know, if he was sitting upright he’s pretty confident that the outcome would’ve been different.” Sanders was left pinned to the floor of his crushed vehicle but was able to communicate with firefighters as they kept him encouraged and worked diligently to perform the rescue. Sanders remains hospitalized in good condition and the truck driver was not injured. Nichols said a further investigation will determine the exact cause of the accident and whether or not any charges will be filed. Sounds like a metal coil load, those things made me nervous, always knew it wouldn't take much for them to break loose. So truckers r daily heros. Why are you always sending trucker stuff. Hi Kiddo! But he had a angel riding with him. Lucky guy. So he wasn't wearing a seat belt? It did not say that. You'd be surprised at how quick you can find yourself thinking and reacting under stress. Apparently you either did not read, or fully understand the article. It commended his quick reaction thinking; as he was laying down as the truck started crushing the top down, he was able to think about undoing the belt to crawl under the steering wheel and lay down on the floor. Some people just like to show their ignorance. He had just enough time to pop it and slip under. So, are you saying that he should've kept his seat belt on so he wouldn't get a ticket?